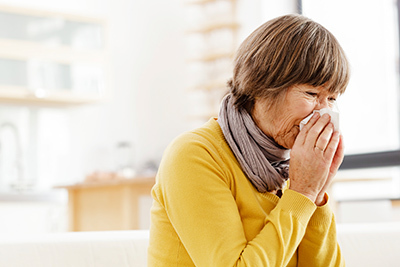 If you help care for your aging Orange County senior parent, then you’ve probably heard the importance of taking preventative measures against pneumonia. That’s because Orange County seniors are much more prone to catching the illness. In fact, according to a 2009 study, the annual incidence of pneumonia among adults over 65 is four times that of younger populations. Read our FAQs to learn why and get tips to identify pneumonia symptoms and ensure a speedy recovery for your parent. As we age, our lung capacity shrinks. This makes it harder to cough up sputum, the mucus our lungs secrete in order to clear infections. By consequence, infections can fester among older Orange County senior adults and, worse, the mucus may accumulate in the bronchial tubes, preventing oxygen from entering the blood and cells of the body. Older Orange County senior adults with dementia may not communicate that they’re not feeling well, thus allowing an infection to go unnoticed and worsen. To help your Orange County senior parent feel more comfortable, you can give him or her over-the-counter medicines for fever and chills. Exercise caution with cough medicines, however, as coughing helps expel mucus to rid the lungs of the infection. You don’t want to suppress coughing entirely, but if it’s keeping your parent up at night, you can get a cough suppressant prescription. First and foremost, help your Orange County senior parent get the pneumococcal vaccine. Experts recommend getting the first dose of this vaccine between ages 50 and 60, and the second at age 65. The vaccine helps guard against 23 strains of bacterial pneumonia (many more exist). Seniors should also get an annual flu shot as pneumonia often strikes after an initial bout of the flu leaves the immune system compromised. BrightStar Care of South Orange County and Lake Forest proudly provides Home Care and Support for Seniors, including 24 hour in home care, and support in independent and assisted living communities. We provide all levels of home care from companion services to Skilled Nursing. Medical Staffing, Home care, In-Home Skilled Nursing, In-Home Physical Therapy for pediatric, adult and geriatric patients, Companion and Personal Care for Elders with Alzheimer’s or Dementia. We also provide Home Child Care, Sitter and Nanny services for Children and Support for New Mothers. We Support Veterans as a partner of the VA/Veterans administration provider network and are a Home Care Provider for U.S. Department of Labor, Division of Energy Employees and Occupational Illness Compensation. We Accept most Long Term Care Insurance benefits, provide Hospice care, Live-in care, CNA, Caregiver, RN, LPN, RN Supervision, Compassionate Care, and Compatibility Guarantees. We are an ALS Society partner, Alzheimer Association member, and provide care for developmentally disabled and individuals of all ages with mental health and behavioral health diagnosis. Other services include safe discharge and transportation from the hospital or rehab facility, Post Op care both short and long term, Pre-Operation and preparation help and assistance, client monitoring for out of town family members. BrightStar Care of South Orange County / Lake Forest proudly provides care for seniors and children, including skilled nursing and non-medical home care, elder care companionship, sitter and nanny services in Orange County and San Diego County, including Irvine, Bonsal, Ladera Ranch, Camp Pendleton, Laguna Niguel, Laguna Hills, Laguna Beach, Laguna Woods,Carlsbad, Newport, Dana Point, San Clemente, Fallbrook, San Juan Capistrano, Oceanside, Vista, Lake Forest, Mission Viejo, Aliso Viejo,Irvine, Rancho Santa Margarita, Foothill Ranch and Coto De Caza, Tustin, Santa Ana, Orange, Newport Beach, Corona del Mar, Tustin, El Modena, Orange Park Acres, Santa Ana, and Orange.